Under the direction of Assistant Senior Patrol Leader John, the troop planned for its upcoming weekend campout at Horseshoe Bend National Military Park in Daviston, Ala. John reviewed packing essentials with current Scouts and the Webelos who were present and soon-to-be members of the troop. Scouts offered suggestions for what should be on that list, and most of the responses were in fact necessities and not just niceties. These essentials are listed with other packing considerations in the Boy Scout Handbook. Scoutmaster Baird reviewed a presentation recounting the history of the Battle of Horseshoe Bend. This year marks the 200th anniversary of the Battle, which took place on March 27, 1814. Mr. Baird also spoke about the campout, including the troop's plan to make a historical trail questionnaire for other visitors to use along the trail to better their knowledge of the park and its history. The troop will also work to create a orienteering course for other Scouts and park visitors to enjoy, and to utilize some Scouting skills and trigometry approaches the troop practiced during its previous meeting to measure distances across water. Through these efforts, the troop hopes to have this trail listed on the list of BSA historical trails. 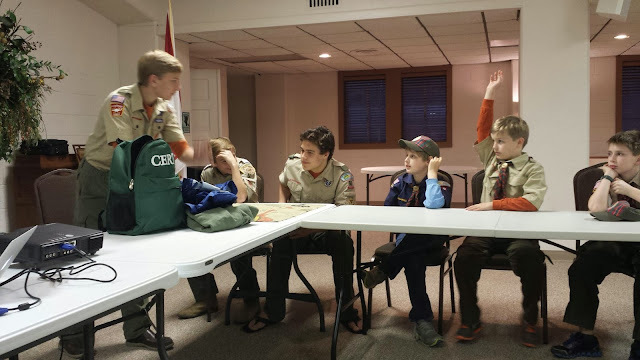 The troop spent the remainder of the meeting working on menus and other campout planning items. Read more about Horseshoe Bend National Military Park at www.nps.gov/hobe/index.htm.